The biggest problem with this bike is the frame geometry. 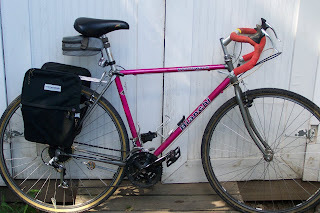 The seat tube and standover is fine for my 5'2" wife, but the top tube is within 1/4 inch of my carbon-fiber racing bike, professionally fitted to my 6'1 frame. This makes it absurdly long for my wife, but easily adaptable for my size. I've no idea why seat tube is the standard measurement for a bike. As long as it isn't too tall, it can be easily compensated for by adjusting the seat height. There is little you can do to adapt a wrong-sized top tube--a longer or shorter stem helps, but changes the feel of the steering. Since the top tube is sized perfectly for me, I took the bike over as my beater when I found a Schwinn World Sport in her size. I prefer road bars, which meant the original shifters wouldn't work. Suntour had gone bankrupt and was no longer available new, and switching to Shimano would require a new dérailleur and freewheel. 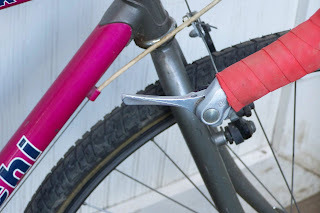 Additionally, downtube shifters aren't easily adaptable to this frame. 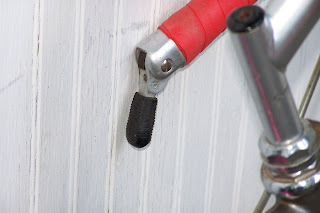 I was able to find a compatible NOS downtube lever, and I had a bar-end adapter from a different project. 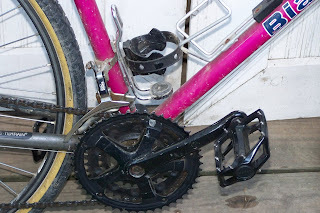 The front shifter is a 70's era Suntour non-index Power Ratchet barcon, one of the best shifters of the pre-index era. The handlebars and brakes were in my junk pile, and I left the original cables on everything but the rear shifter, so I've got one white cable, 2 silver cables and one black. The stem looks like it is set very high for a road bike, but that is another artifact of the odd frame geometry. One water bottle cage is standard, one is a Walmart special with an adjustable rubber strap. This will hold non-bike bottles much better than the normal cage, but it isn't as convenient to get the bottle in and out of. The wheels are Campagnolos I bought from Nashbar in the early 90's. so I could have two different sets of gears on a bike I sometimes pulled a trailer with. I think the tires are the original ones from the bike, and they are nearly perfect for my purposes-fairly smooth tread, but 38mm wide, rather than the 23mm I run on my racing bike. Being wide, I don''t have to put air in as often, being smooth they don't slow me down much, and there is just enough tread to deal with the occasional grass and mud. 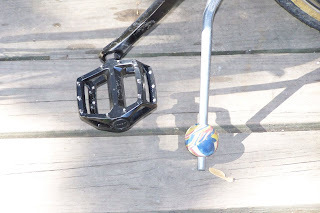 The rubber ball on the kickstand is there to help keep the bike upright if I park in grass. The pedals are meant for a serious BMX bike. They are larger than standard to better support my big feet, and they have screw-in replaceable spikes to hold shoes (or especially sandals) firmly to the pedals, even when wet. The idea came from Rivendell Bike Works, the pedals came from Tipp Cyclery. These pedals are a tremendous improvement over the standard plastic pedals the bike had originally. If I remember right, the rack came on our tandem, but I had to change it when I switched to a different type of brakes. Works fine on this bike. 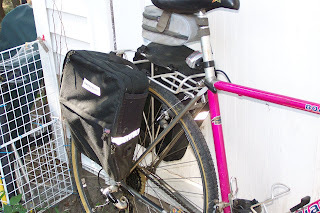 The panniers were at a garage sale in near new condition for $3. Very handy, and worth leaving on the bike unless I'm racing. I've left the original seat. It isn't a great seat, but although I ride this bike often, I rarely ride it far enough that the seat becomes an issue. I just purchased 1 of these bikes same color and all I paid $ 60 for it was wondering what year it was. I think I bought it in the mid 1990's, but it was a few model years old then. I'd guess around 1994 or so.